Is your Presto Pressure Cooker missing its weight? Is your pressure cooker not building any pressure any more? You probably need a new Presto pressure cooker regulator. This original part (9979) fits several 6 and 8 quart cooker and models. This part sits atop the vent on your cooker's lid and rocks back and forth to regulate the pressure level within the cooker. It also acts as a lever to safely release steam pressure before opening the cooker. If your regulator is worn or missing, it is not possible to build pressure within the cooker. 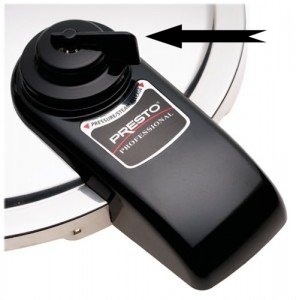 Purchase a new Presto regulator to bring your pressure cooker back into service. 0137003 0137001 0136304 01370 0128303.